BlackBerry 7130e is a wireless communication Smartphone device that features complete BlackBerry functionality such as phone, email, text messaging (SMS and MMS), wireless data access, address book, Internet browser, calendar, memo pad and tasks. 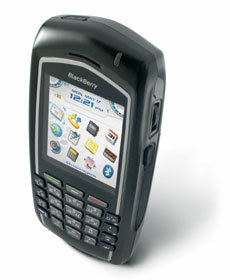 Other features include ability to access up to 10 business and personal email accounts, speakerphone, SureType technology, QWERTY keyboard, Bluetooth hands-free headset, car kit support, large color LCD screen, Ev-DO network support, polyphonic ringtones, integrated attachment viewing for popular file formats, 64 MB of memory, 800/1900 MHz cdmaOne network support, CDMA2000 1X network support and assisted GPS. I4U (link dead) reviews Spring BlackBerry 7130e and concludes that while the 7130e is certainly not the most feature-rich phone we’ve ever seen, it’s also not the most expensive – not by a long shot. It’s the BlackBerry for the non-CEOs out there. Overall, there’s nothing glaringly wrong with the phone. It just doesn’t go above and beyond to provide an unbeatable competition against other similarly priced phones. Top Tech News (link dead) concludes with rating of 3.5 out of 5 that the BlackBerry 7130e, which is available from Sprint for $199.99 with a two-year contract, delivers high-speed EVDO capabilities at a very attractive price. But anyone with intensive text-entry needs should seriously consider buying an EVDO-enabled device that offers an expanded Qwerty-style keypad.